The Reivers Way is a remarkable tour of the border country of Northumberland. Beginning in the ancient Roman town of Corbridge and ending at the picturesque estuary village of Alnmouth, the Reivers Way has just about every type of scenery offered by rural dale, moorland, mountain and coast during its 140 mile length. 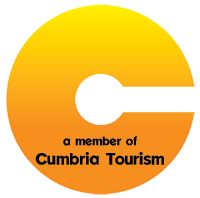 There are Roman forts, medieval castles, famous lighthouses, pretty villages and quaint fishing harbours. The Reivers Way is not as popular as the Pennine Way or Hadrian's Wall, but it absolutely deserves to be. If you are looking for great walking away from the crowds, passing through constantly changing scenery and enjoying the fascinating culture, history and hospitality of Northumberland, the Reivers Way is for you! Our recommended itinerary for the Reivers Way splits the walk into 9 stages with 10 overnight stops, which gives a walking day of typically 17 - 19 miles, with a couple of shorter days and one challenging day of 20 miles over the Cheviot. This staging will suit experienced long distance walkers. If you prefer to take more time over the Reivers Way, walking shorter stages, or if you would like us to suggest a 'highlights of the Reivers Way' itinerary tailored to your personal preference, just let us know and we will supply you with a quick quote. CORBRIDGE: Corbridge is on the Carlisle to Newcastle line. There are hourly trains from Newcastle taking 32 minutes. The journey time from London via Newcastle is approximately 4 hours and from Manchester is approximately 3 hours 20 minutes. RETURN from ALNMOUTH: Alnmouth is a stop on the line between Berwick and Newcastle. There are regular trains to Newcastle taking approximately 30 minutes. The Reivers Way has a huge variety of scenery including gentle walking along river valleys and more challenging terrain across wild moorland, through extensive forest and over lofty hills. The trail ends with an undulating walk along the Heritage Coast of Northumberland. 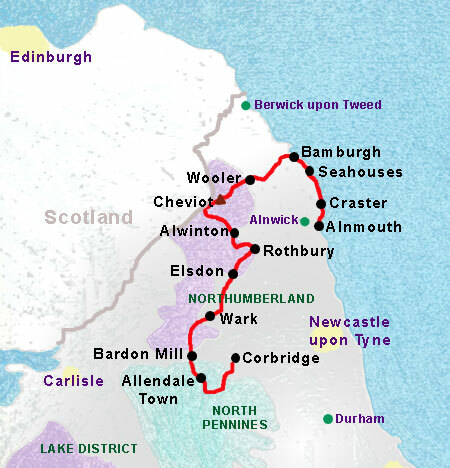 The route pases along and through lots of famous places such as Allen Banks, Hadrian's Wall, Simonside Crags, The Cheviot, and Bamburgh and Dunstanburgh Castles. Away from these places not many people walk these trails and you are likely to not see another sole on stretches of several miles. There are no dedicated waymarks for the Reivers Way and a guidebook and map are essential. The route is maintained to a reasonable standard by the local council.